April is for flowers and colours and happy clothes, and that’s exactly what I filled it with. There was some time spent with friends in London, lots of catching up with old friends I haven’t seen in a while, and several lady dates, so I enjoyed sprinkling florals and bright colours among my wardrobe choices for those events. Next month is my 30th birthday, so I’m hoping and expecting to use that as an excuse to get the full on glam going once or twice. For now, let’s boing into spring together. I don’t wear a lot of pants. I don’t find them as comfortable physically as skirts or dresses, nor as comfortable in terms of body confidence. However, since I’m trying to work on the latter I’ve been making more of an effort in the last few months to try different items of clothing I normally would steer clear from, with trousers especially, since winter is just a sensible time to be embracing them. Most of the Autumn/Winter 15 offerings from Pinup Girl Clothing have been more along the lines of event wear, but the Houndstooth cigarette pants immediately caught my eye, even though, at first, I had no intention of actually trying them. As time wore on, I found myself wondering about them more. Maybe I would pick up a pair. The pattern might be somewhat disguising for my bumps and curves, I guessed, and they’re a better length than rocking capri pants in winter. The sizing information available, though, gave me massive pause. They size small, I heard, from multiple people and the size chart said they ran small. Laura Byrnes, PUG’s founder and head designer, confirmed it for me; they came in smaller than expected, size up. But no, I personally found they’re more forgiving than their past Cigarette Pants, someone else told me. What’s a girl to believe?! ‘Tis the season to be jolly and twinkly and glam! I love Christmas time, even though it’s busy and over far too quickly. Seeing friends and family as much as possible and spoiling them with gifts and joy warms my heart, and I’ll be honest, picking out my outfits for wearing over the Christmas period is one of my favourite parts now. It’s been an incredibly busy month though and I didn’t get to wear as many pretties as I expected. but hey ho, the perfect excuse to start 2016 off with a bang! As usual, you can find links in the description to any item that is still available to buy. Anything not linked is from a past season and cannot be found for purchase any longer and/or is not available to buy online. I have a thing for winter appropriate prints, checks, tweeds and weighted fabrics. They never go out of style, which means when you buy a piece in that kind of fabric you know you can wear it year after year regardless of the passing current trends. This holds even more true when the pieces are vintage inspired, so I was pleased to see that Voodoo Vixen made several pieces in their AW15 line that fit this outline. The Pia pencil skirt is the one that most caught my eye from the VV workwear appropriate new pieces. It’s a lightweight highwaisted grey pencil skirt sporting a tweed inspired print with kick pleats in the back. From the same AW line I picked up the Sophie top, a black three quarter sleeved top with plenty of stretch for comfort and a great button detail staired neckline. It always surprises me how few repro clothing companies offer a variety of sleeved dresses for their AW lines each year. For people in warmer climates I know a sleeved dress has limited or no wear value for them, but personally I get a bit sick of having to layer a cardigan over most of my dresses in autumn and winter, even if the dress itself is very AW in print but simply lacks sleeves. And it’s not that I have a problem with cardigans, just that sometimes I want a dress that comes wearable this time of year as is, complete and polished and seasonally appropriate in wear. 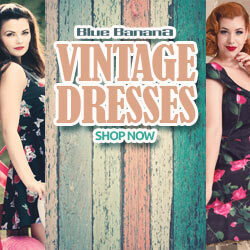 Collectif have come through on that with their Trixie doll dress. Made of bengaline, it’s a super comfortable stretchy swing dress with half sleeves, a cross over style bust and a full skirt, with a gathered detail on the front of the shoulders. I’ve featured Heart of Haute before reviewing their Milan dress and Diva skirt suit. The Beverly dress is one of their classic designs they often release in new prints, totaling up to 15 available colourways at my last count. Their new colourways have been quick to sell out this season, with their red matrix flying out the doors, so I was lucky to get my hands on their Metro Silver to review as part of this party dress series. The Beverly dress is a more conservative option for ladies concerned with bust lines but that doesn’t detract from its glamour or prettiness. The neckline is wide and scooped, displaying the delicacy of the collarbone offset with a bow detail on the left-hand side. It’s fitted through the waist with princess seams leading into a full skirt, which is approximately 25 inches long and ends just below the knee on me, at my height of 5 ft 7. It closes with a back zipper and is 100% cotton.